Bryce Cunningham (L, 4-1) and Travis Scott; E. Finley (W) and C. Finley. Hitting star - Illini Central - Chris Norton (double). Record - Illini Central 10-4. Note: Game played at Mason City because of wet grounds at Athens. Casey Erickson (W, 6-0) and Pinkstaff; Ryne Komnick (L, 2-4) and John Peters. Records - Chatham-Glenwood 17-1; Lincoln 10-8. Jennifer Eardley (L), Miranda Jones (5) and Tara Robinson; Jessie Shay (W, 12-1) and Amber Lessen. Hitting stars - Olympia - Tiffany Prager (3 hits), Amber Darnall (3 hits, RBI), Canopy (triple, RBI). Pitching star - Olympia - Shay (5 strikeouts). Record - Olympia 20-1 overall, 5-0 in Corn Belt Conference. 3. Delavan/Hartem 86; 4. Illini Central 62.5. High jump - 1. Clint Wells (IC), 5-10; 2. Fox (D/H), 5-6; 6. Mills (IC), 5-2. 1,600 relay - 2. Illini Central, 3:52.87. Varsity shot put - Schultz (O), 51-4. 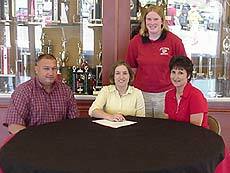 [APRIL 30, 2003] Jennifer Cyrulik, a 5-foot-4 guard from Clinton Community High School, has signed a national letter of intent to play basketball at Lincoln Christian College. In 2003, Jennifer was selected to the all-area basketball team. She was a three-year letter winner and was a captain her senior year. She also received Clinton’s most valuable player award in 2002 and 2003. During her senior year, Jennifer was the second leading scorer for the Lady Maroons, averaging 6.3 points per game. 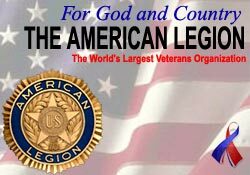 Jennifer is the daughter of Mike and Cheryl Cyrulik and will major in Christian business administration. Pictured from left to right are Mike Cyrulik, Jennifer Cyrulik, LCC coach Amanda Bowman and Cheryl Cyrulik.